Keeping your company from penalties and fines from hazardous waste violations requires a lot of hard work and an understanding of the all the rules and regulations asscoaited with hazardous waste. In order to help California companies, understand their obligations under the complex hazardous regulations under the Resource and Recovery Act of 1976 (RCRA), we’ve put together this list of hazardous waste disposal best practices. Take a good, hard look at your operations to ensure that you have these 10 areas covered. Containers must be clearly labeled as hazardous waste. name and address of the generator. Hazardous waste generators have the sole responsibility to select the appropriate classification for waste they generate, and must know what regulations apply based upon their hazardous waste generator status. Step 1 - Determine if the material is solid waste. Step 2 - Determine if the solid waste is exempted or excluded from hazardous waste regulation. Step 3 – Determine if the waste is a “listed” hazardous waste. It is a major no-no to either mistakenly or purposefully dispose of hazardous waste into municipal dumpsters or into sewer systems by dumping waste down the drain. Companies must first understand their hazardous waste generator requirements which dictates the procedures they must follow in terms of hazardous waste disposal and reporting. It is also important that generators understand that the law dictates a “cradle to grave” requirement and that all hazardous waste generators are responsible for the proper disposal of their hazardous waste streams. In order to properly track hazardous waste streams properly a uniform hazardous waste manifest must accompany most hazardous waste that is shipped off site. The Uniform Hazardous Waste Manifest is the shipping document that travels with hazardous waste from the point of generation, through transportation, to the final treatment, storage, and disposal facility (TSDF). Each party in the chain of shipping, including the generator, signs and keeps one of the manifest copies, creating a "cradle-to-grave" tracking of the hazardous waste. Companies, laboratories and colleges and universities must take precaution to track and properly dispose of expired chemicals. 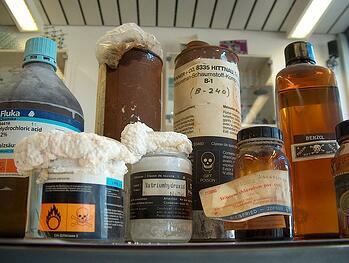 Chemicals at the end of their usable lives can be very volatile. If they are mistakenly mixed with other potentially reactive agents, or simply have decomposed due to age and become less stable, they can become a tremendous hazard. Proper procurement, inventory management, end-of life disposal practices are the key to reducing or eliminating the risk posed by expired chemicals. A written Hazardous Waste Contingency Plan is a program designed to minimize hazards to human health and the environment from fires, explosions or an unplanned sudden release of a hazardous waste. The plan lays out an organized, planned and coordinated response to an emergency. The type of contingency plan required for a facility depends on your hazardous waste generator status. Failure to develop and notify the proper authorities is a violation of hazardous waste laws. It is important to establish a proper training routine for your employees in order to increase the safety standards of your workplace. Many contractors are required to use 40 Hour HAZWOPER (Hazardous Waste Operations and Emergency Response) trained personnel as contract specifications indicate and for submittals for bidding. The HAZWOPER law was meant to be broad and to encompass personnel involved with hazardous materials and hazardous waste management. Open containers containing hazardous waste are a common hazardous waste violation. The laws dealing with hazardous waste containers are very clear. Containers with hazardous waste must be closed and latched at all times except when adding or removing waste. The EPA has been cracking down on improper storage and disposal of mercury related products including assessing heavy fines for improper disposal. Mercury waste includes mercury-containing industrial wastes and also discarded mercury-containing products. Mercury and most of its compounds are extremely toxic and must be handled with care. Many companies are making a critical mistake by trying to reduce the weight and volume of their waste streams by extracting the small amounts of mercury in commercial products, collecting it and throwing away the heavier plastic and metal, you have changed the characteristic of the waste stream from a commercially produced universal waste stream to elemental mercury. This can lead to a lifetime of cost for elemental mercury storage. This is a costly mistake. Hazardous waste generators are required to perform a weekly inspection of the hazardous waste container storage areas. If you would like a free hazardous waste storage checklist just click the link. It is very easy to implement standard procedures and maintain compliance. Keep your company in compliance. By following these strategies, a waste generator can reduce the risks of incurring financial penalties and damage to its reputation.